As I was walking to the Muhammad Ali tribute I noticed there were round plaques on the sidewalk and realized they were in honor of past academy award winners and thought that was odd. I assumed they would be found in Hollywood and Vine not downtown LA and then I saw a sign that said welcome to the Grammy Museum. I didn’t have time to visit this time but I will be back to spend some time inside and let you know what I think about it in a future post. 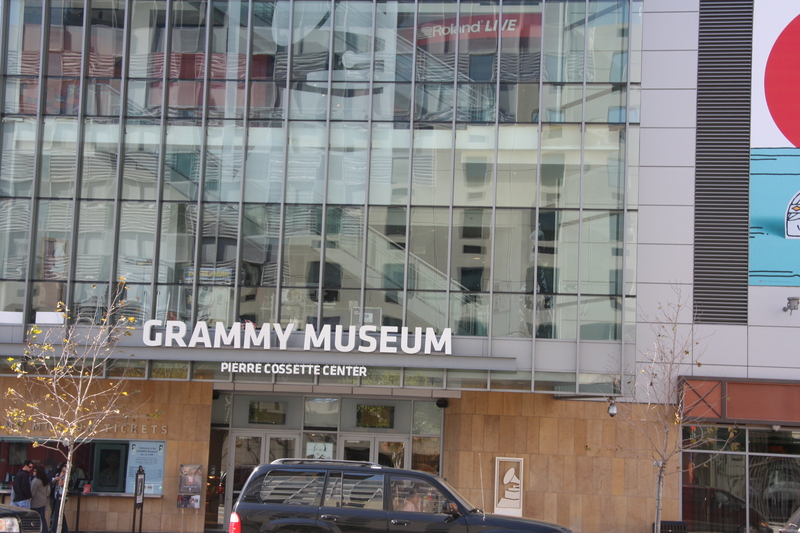 Debuted December 2008 in conjunction with the 50th anniversary of the Grammy Awards, the Grammy Museum is billed as an exciting and interactive celebration of the power of music occupying a vibrant new space in downtown Los Angeles. Four floors of cutting edge exhibits, interactive experiences and films provide a one-of-a-kind visitor experience – engaging, educational, celebratory and inspirational. This entry was posted in Photography and tagged arts culture, Grammy Museum, I’m Posting every day in 2011, Inspiration, Los Angeles, Photography, Quotes. Bookmark the permalink.